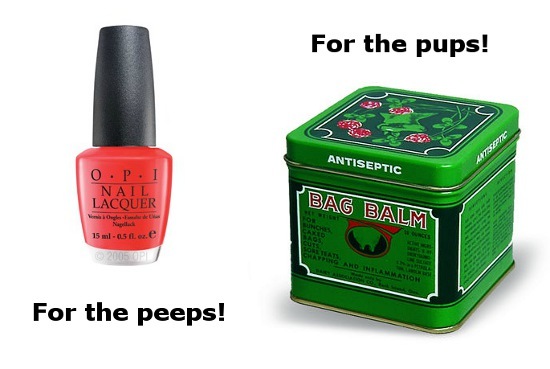 Beat the winter blues with a little bit of pampering for you and pup. Bag Balm is an excellent cream that is safe for use on a dog’s paws to help treat and prevent cracked pads, which is especially important when they are out and about on salty sidewalks in the cold. This balm is actually used to moisturize a cow’s udder, but is completely safe and effective for canine tootsies! Plus it’s Canadian! (For best results and to stop your pup from licking it all off, as Rory tries to do, apply balm gently to paws then cover with booties for about 30 minutes). Meanwhile, to help your own feet stay pretty this season, why not indulge in a stunning red polish? This one is a particular favourite of mine from O.P.I. called “My Chihuahua Bites” — how cute is that? PAWSH PERKS: My favourite brand of dog boots and why wearing dog boots is important for your dog’s safety.